However, to my surprise, Mr. Bathgate returned me a different card and in my opinion a much nicer card than the one I had sent. This card which he had autographed is from the 08-09 UD Masterpieces set. The set is comprised of 87 cards each designed to look like it was printed on canvas. This was the only season that UD created a Masterpieces Set for hockey and I wonder if it was because they weren't a big hit with collectors. Personally, even though I never collected any of these cards, I do find them visually appealing, but at nearly $90 a box for 64 cards including a max of 4 autographs, I don’t feel they are a good “value”. In the end, Mr. Bathgate decided to improve my TTM request by sending me back an autographed 08-09 Masterpieces card which he signed in blue sharpie and included both his HOF year and number as a player. In all it was an amazing result from a great Hall of Fame player. 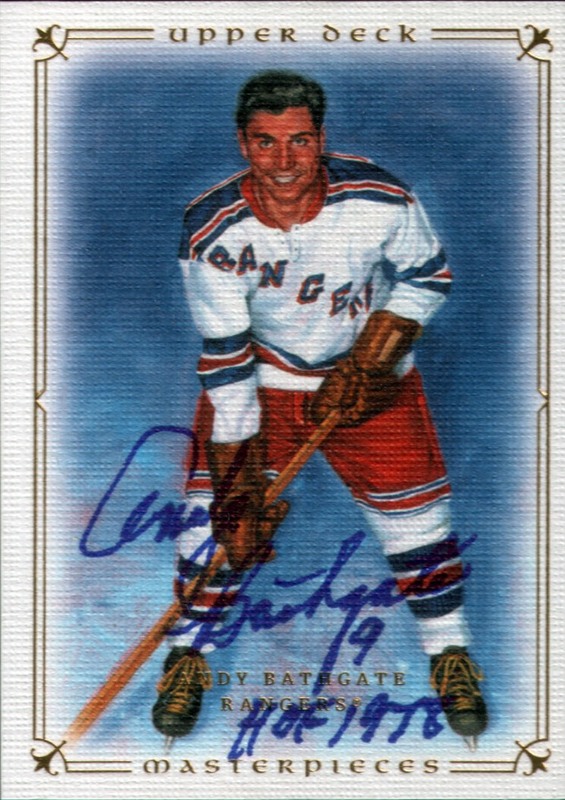 Andy Bathgate spent nearly 20 years in the NHL and averaged nearly a point a game during his career. To illustrate his skill and talent, Andy Bathgate’s lone Hart Trophy win was done in a year when the Rangers didn’t even make the playoffs! 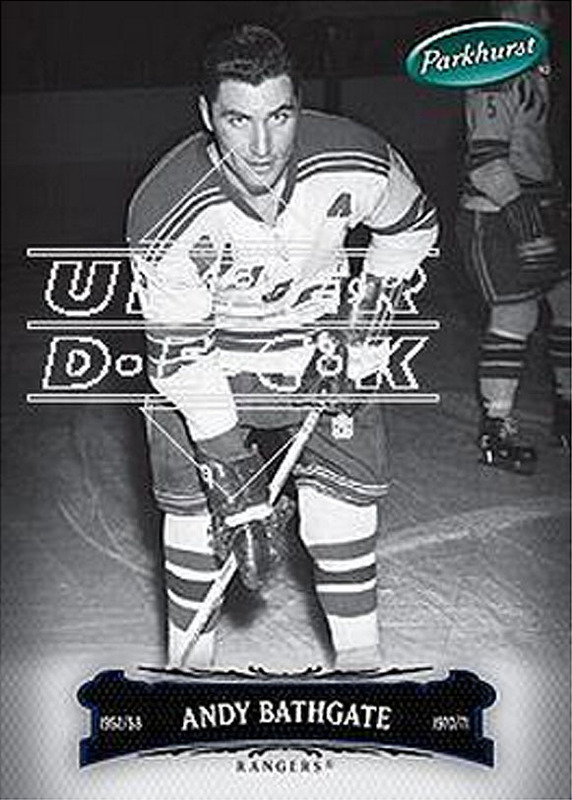 Andy led the Rangers in scoring for 8 straight seasons starting in the 1955-56 season. Andy’s final career numbers were 1069 games, 349 goals, 624 assists and 973 points which included two first and two second team all-star selections. The Hockey News recently reissued their top 100 players of all-time which were broken down by the best 20 in each position. Andy Bathgate finished in 13th spot for right wingers, just ahead of Pavel Bure. 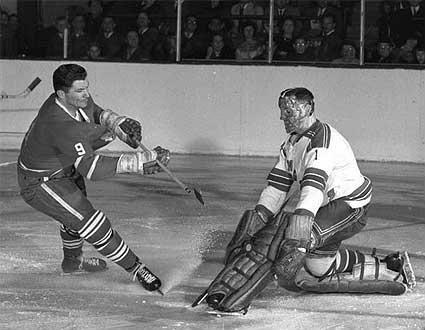 For those of you who don’t know, Andy Bathgate is the man responsible for Jacques Plante needing to wear a goalie mask. Here is a video that shows Andy’s side of that historic story. So the card he sent you. Is it worth more then the other one? I have started sending out cards to get autographed. Nothing back yet. In terms of unautographed card value I would say they are about the same less than a buck. But I really like how attractive the Masterpieces card is when compared to the 2006 Parkhurst. Since I plan on keeping the card the value difference to me is quite significant! You will have to post some of your successes on here! I wish you the best of luck! The key is to be patient, but once they start rolling in, you will probably get hooked like I did. Lets hope the postal strike doesn't happen so you can continue to mail out your requests for autographs. I enjoy reading this weekly post!